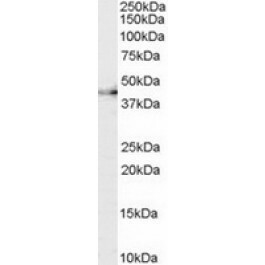 Western Blot: 0.3 - 1 µg/ml. CNTF Receptor alpha is a receptor belonging to the cytokine superfamily of receptors. Along with LIFR and gp130, CNTF Receptor alpha forms the heterotrimeric CNTF receptor complex. The receptor is attached to the membrane by a glycosyl-phosphatidylinositol linkage and contains an immunoglobulin-like C2-type domain and a fibronectin type-III domain. During signal transduction, CNTF first binds to CNTF Recepror alpha, and this permits the recruitment of gp130 and LIFR beta to form the tripartite receptor complex. Signal transduction stimulates gene expression, cell survival or differentiation in a variety of neuronal cell types. Alternative splicing has been observed at this locus and two variants, both encoding the same protein, have been identified. This antibody reacts to CNTFR.